Explanation: How often does a Full Moon occur twice in a single month? Exactly once in a Blue Moon. In fact, the modern usage of the term "Blue Moon" refers to the second Full Moon in a single month. Tonight's Blue Moon (Universal Time) will be the first since September 1993. 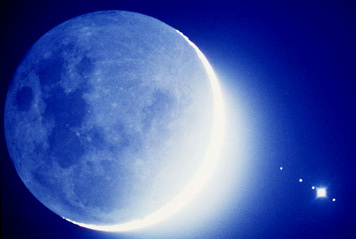 A Blue Moon typically occurs every few years. The reason for the rarity of the Blue Moon is that the 29.53 days between full moons is just slightly shorter than the number of days in the average month. Don't, however, expect the moon to look blue tonight! The term "Blue Moon" is thought to derive from common language expressions used hundreds of years ago. It is possible for the Moon to appear tinged by a blue hue, sometimes caused by fine dirt circulating in the Earth's atmosphere, possibly from a volcanic explosion. The above picture is of our Moon taken was taken in a dark blue morning sky. The bright crescent is the only part directly exposed to sunlight - the rest of the Moon glows from sunlight reflected from the Earth. In this dramatic photo, however, the planet Jupiter is also visible along with its four largest moons.